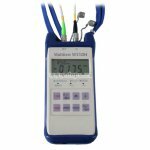 New budgetary device MULTITEST MT1113C is designed to measure the optical power at operation of optical networks of cable television, Ethernet, and for test measurements in research and testing laboratories. Up-to-date circuit solutions provide excellent technical performance and the full measurement functional: measurement of absolute and relative power of optical signal at 6 different calibrated wavelengths, detecting the modulated signal 270 Hz, 1 kHz and 2 kHz, extended range of the measured power (-50... 26 dBm). Compact housing can easily fit in the palm of your hand; its housing is covered with a rubber casing for shock-protection. Also, for ease of use, the device is equipped with a display backlight that can be switched by a special button. For work in stationary conditions, the delivery set includes a power adapter for supply from 220 V mains. Possibility of supply from 220 V mains. 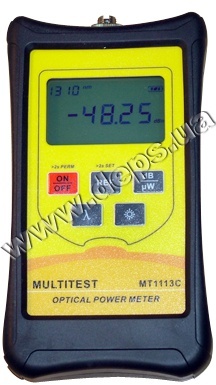 Optical laser emitter MT3109 is designed to supply optical signal into fiber at testing of optical lines, loss measurement in optical lines and devices. 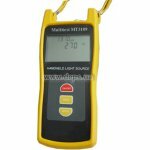 Depending on the model, the device can be equipped with a laser sources with one, two or three wavelengths - 1310, 1550 and 650 nm. Optical signal 650 nm in the visible spectrum section (red light) is fed from the second output port and facilitates trouble-hunting in the cross components, allows for identification of fibers. 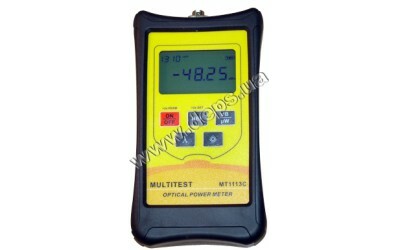 Optical tester Multitest МТ3204 integrates in fact two devices: optical power meter and optical radiation source. This extends the possibilities of the device application for testing the optical lines, loss measurement in optical lines and devices. 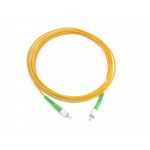 These patch cords are simplex or duplex pieces of cable of certain length and external diameter, terminated from both ends with connectors FC.